Imagine this. A windy wet January day. Me and two small boys trying in vain to hold our hoods on our heads after leaving the warmth of our car, walking the wet sidewalk that will lead us to the West Seattle farmers’ market. We are in search of two breadsticks, apple cider, and some inspiration for dinner. I love this market. It runs all year, is food only, and never seems to feel crowded. Plus it has some of the best vendors. But it is a sad and lonely place in January. Sure, the cider guy is there, cheerful as ever. The bakery woman sees us coming and puts the breadsticks in a bag. The apple people were so delighted by Graham’s enthusiastic “Thank you!” that I felt we made their day. But there was not a lot of dinner inspiration. And then I remembered that I had a bag of fresh cranberry beans stowed away in my freezer. I buy them every summer and hide them from myself for a few months until I forget they are there, and then remember them in the middle of a deluge in West Seattle. I quickly made the rounds again of the few vendors who had braved the elements. Leeks, celery root, delicata squash, gorgeous purple potatoes. I knew I had half a cauliflower and some kale at home. Soup! Now, please believe me when I tell you this. This soup was gorgeous just out of the pot. The colors were a knock out. Purple, red, vibrant green, and orange all together in one bowl. Did I take a picture when it looked like that? Of course not. I waited until the next day when the soup looked a little sad and sorry but tasted, if this is possible, better. I realize that most of you do not have a bag of fresh cranberry beans stowed in your freezer. (And if you do, can I have some?) You can use a can of your favorites. Or better yet, cook up some dried beans. They hold up so much better in soups in my opinon. 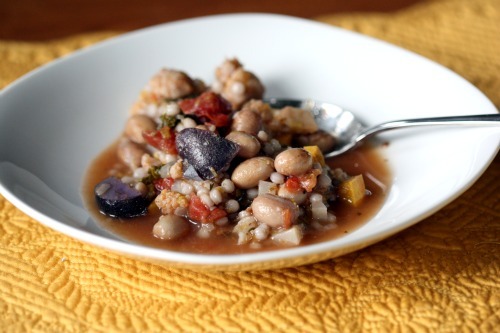 You will want about 2 cups of cooked beans. Place a soup pot over medium heat. Add just enough olive oil to coat the bottom and then add the leeks and a large pinch of salt. Sauté until starting to soften, stirring constantly, then add the potatoes and the thyme. (Leeks burn quickly, so be attentive.) Cook for 5 minutes, stirring often, then add the celery root and the squash. Cook another 5 minutes, adding a bit of water if things are sticking too much to the bottom. Next add the tomatoes with their juices and the cauliflower and cook another 5 minutes, stirring often. Stir in the beans and pour in the stock. Bring to a boil, then lower the heat to a simmer. Sprinkle in another pinch of salt and cook, stirring occasionally, until the vegetables are tender, about 20 minutes. About 10 minutes before serving, add the kale and turn the heat up so the soup comes back to a boil. Add the couscous and cook, stirring often, until the couscous is al dente, about 8 minutes. Season to taste with salt and pepper. Serve the soup in wide bowls garnished with Parmesan. I wish we had a farmer’s market in the winter. Ours shuts down in October:( I love everything about this soup. Great recipe Dana! This is my kind of soup and soup always, always tastes better the next day. Now I want to visit my local farmer’s market. Our farmer’s markets are in a similar state of despair, and I have NO fresh beans of any sort in my freezer to speak of. Sigh. Next summer I’m stocking up. This soup sounds delicious and I’m so glad it tastes better the next day because, since I’m cooking for one, I’m sure I’ll have TONS of leftovers when I make it! That soup looks absolutely delicious, so I can just imagine what it must have looked like before. Isn’t it nice to be part of a community like that where people know you? I also wish our farmers’ market stayed open! We’re very lucky to have a small, organic produce supplier right down the street, though, otherwise winter would be an even lonelier time! This soup looks so good, in so many ways. 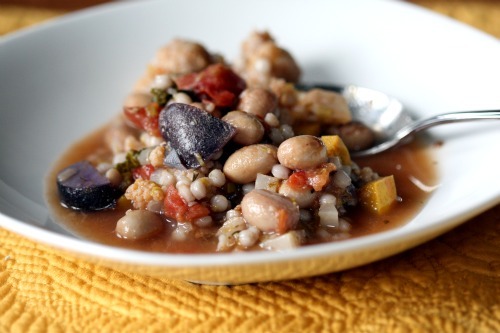 Looks delicious and healthy and I love your addition of couscous! While I’m sure the colors were absolutely brilliant when freshly made, this photo imparts the true “essence” of a winter comfort soup, in my opinion. I’ll bet it’s equally good with barley for those of us who are wheat-sensitive. Thanks for the inspiration! What a gift for your boys! Memories you will share forever! Trips to the Farmer’s Market….and then HOME to the kitchen! I will have to try this market! I’m always in search for some good breadsticks…especially when we entertain. Surely ONE DAY you will have a cookbook! This is my type of soup to try out! Thanks for sharing! the soup sounds delicious and hearty,, perfect for this weather! I am absolutely new in this blog world. Recently created my own , called it Sunshine & Smile (www.kankanasaxena.net). came across your space while hopping around .. it’s great and i am sure there’s lots i can learn from here .. beautiful beautiful photography and such a perfect soup !